Tags: justice, child abuse, sexual violence, education, identity, civil war, conflicts. Murhabazi Namegabe: a carrier of peace. Murhabazi Namegabe is married and has one child. He is the third born in a family of 14 children. He would have become an Assistant at the University because he likes writing but he decided to contribute tothe wellbeing of children in his country the DRC. 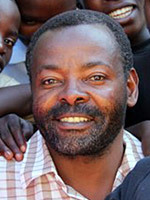 In the Kiswahili language his name would have meant the savior: one who saves children from abuse. Tags: food, local food, cuisine, gastronomy, diets/dietetics, health, creativity, sickness, taste, added value, culture, good eating. Saly Wade: Cuisine to reconcile identity, gastronomy and the health. Saly Wade experienced great problems of health and decided to work on her lifestyle deep up to her daily consumptions: she decided to prepare her own food. 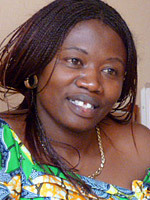 Saly teaches at the University Cheik Anta Diop de Dakar as Geographer. She suggests to promote the value of food intakes and the act of good eating. She suggests local cuisine and gastronomics together with dietetics with the role therapy (dietotherapy) and art. Open to the World and integrated to changes in relation with socio-economics, the model of Saly promotes local products. We have an excellent way to prevent non transmissible diseases as they are now common in big cities before they go to rural areas, she says in an interview. Looking at our feeding behavior grows is for Saly Wade an indication of regular changes in social transformations. 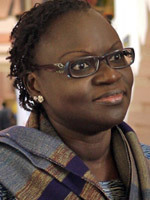 Saly Wade talks therefore of identity and culture where Africa could emerge within its uniqueness. Tags: justice, war, responsible citizenship, radio, local collectivity. 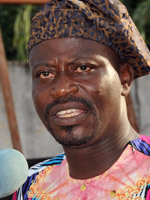 Kamuntu Jolly, the expressionist. 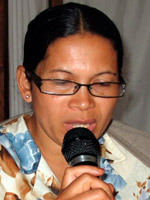 Kamuntu Jolly is 36 years old, she has three kids and she is a communicator. Madam Kamuntu is that lawyer who got into the radio like in religion: with faith and passion. She started with Catholic radio Maria in 2000 and she joined radio Maendeleo afterwards in 2004. She had different functions first as a collaborator up to the direction of radio Maendeleo through the positions of journalist, redactor and responsible of programs. 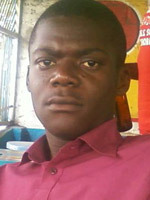 Today, Kamuntu is the director of radio Maendeleo and head of the AFEM. Tags: street kids, witch kids, reintegration, training. Ollie David Levi, self made person. The project of David Ollie takes roots from a sad experience that he lived at his young age. He managed to transform his traumatism and frustrations in an entry point to change the regard of his society. At the age of seven indeed, David Ollie was thrown and abandoned on the street where he grew up as a street child. Fifteen years later David creates an NGO with an aim to support his fellows street children in his country, the DRC. Tags: justice, land law, citizenship, local groups, administration. Esther Vololona Razazarivola: justice for all! Vololona Razazarivola is 50 years old. She is married and has two children. Esther has quickly learnt to struggle for her life. Early after her studies she joined the Congregation of the sisters of Andrefanimanana in Mantasoa where the superior of the sisters suggested her to go to the community of the sisters of Christ. She refused the offer and started to engage in a struggle against violence, including violence for acquiring the land ownership. She opted to use the law of her country for tackling the violence that weak people especially women are suffering from. Tags: art, culture, marionnet, spectacle, awareness raising, festival, education, workshop. Jude Zounmenou, artist. First born of a family with four boys, Jude Zounmenou, stopped his studies to become a comedian. He learnt by doing through personal contact with artists after public shows. He quickly found his way which is much connected with marionnets that he makes with his team. Together they spread happiness in the four corners of Benin. The Harubuntu International Prize will not be held until further notice. After 6 intensive and exciting years, we take a step back, capitalization and learning. To continue to follow us and be kept informed of our activities, we invite you to visit the website of Echos Communication. Video presentation of the winners in 2013 are finally online. Visit the Press section! The award-giving ceremony will take place in Brussels on December 6th at the end of a two days workshop on ownership: "Ownership in progress: two days to share our tools and experiences". Congratulations to Yasmina El Alaoui, Laurien Ntezimana, Noëline Razanadrakoto, Achidi Valentin Agon, Juana Vetsohantaina Hellia and Florida Makarubuga.